Oohhh, what's this? 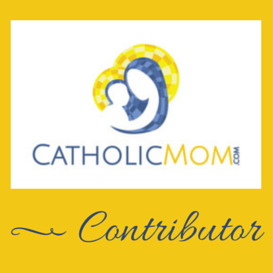 A surprise edition of the Catholic Book Club, how fun, right?! I was asked to review a women's devotional, and since the topic is perfect for this blog, I happily agreed. Books are what we do, yes? 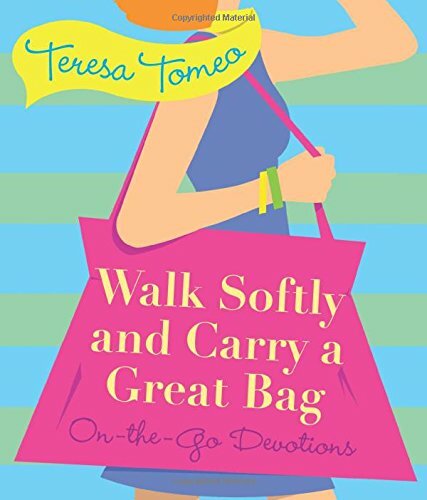 What we have here is Walk Softly and Carry a Great Bag: On-the-Go Devotions, by Teresa Tomeo. This is a small book, strategically designed for you to be able to carry around in your purse. If you get the physical book, that is. It is indeed also available as an ebook, but we'll come back to that. Verdict? This is a cute little thing! I like books that are sized like this for convenience. And the tone of this book is my very favorite - light, humorous, applies real life anecdotes to larger spiritual realities. There are 70 devotions included, so this isn't an "entry a day" type of devotional. It's a "whenever you need a pick-me-up, open this up to a new spot and await inspiration" type of devotional, reminiscent of the Don't Sweat the Small Stuff series. Each entry starts with a scripture verse, and is followed by two to three pages of reflection on how the spiritual is woven into everyday, ordinary moments. All of the reflections conclude with a short prayer to apply the spiritual lesson into our own lives. "When the righteous cry for help, the Lord hears, and delivers them out of all their troubles." Psalm 34:17. Teresa then recounts how at one point she was struggling with an important decision about her career. She went to Mass and prayed about this. Afterward, someone came up to her and gifted her a medal of St. Gabriel with a clear answer to her question printed on the back. Obviously, the person who gave her the medal had no idea how instrumental this was for Teresa at that moment, or that the words on the medal would be so moving to her. There are a lot more details about this story in the book itself, but just using what I've written here, I LOVE reading about moments such as these. Why? Because we've ALL had moments like this. There is a storm brewing in our hearts and minds, and then suddenly...we see something, or someone says something to us, or we hear something on television, and it just FITS. It's clear to us that God was using this other person or situation to speak to us. And when we're feeling overwhelmed or blue, we need those reminders to LISTEN, you know? God hears us. He wants to speak to us and soothe us. But we need to prayerfully await His voice. Isn't it precious?! I didn't know which color I would receive (since the publisher graciously sent me one) and I have to say, they obviously know me very well, because I adore fall colors. 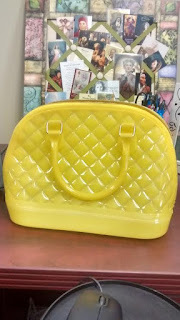 I am in love with the yellow! But there is also pink, blue, orange (*swoons! *), mango and purple, and a few sparkle options. Great gift option for the coming holiday season? Absolutely. 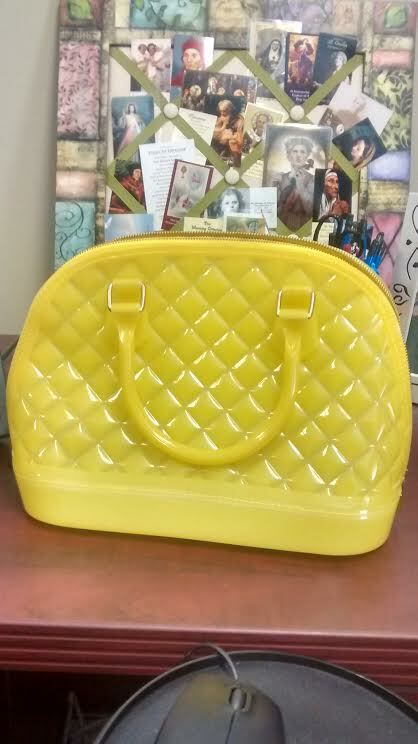 The purse texture reminds me of those jelly shoes that were so popular when I was in junior high. ("Tiffany, you grew up in the 80's didn't you?" "How ever did you know?!") Very sturdy and durable, and importantly for moms, cleans up super easily from leaky beverage containers or explosive poo diapers. I'm just *saying*, we all know it happens. :0 There are no pockets or anything, it has a single zipper running across the entire length and sides. But the bottom is extremely wide and hence the interior is downright spacious. You could pack a lot of stuff in this girl! It is *very* cute. I am supposed to be getting this book and bag to review as well. So cool to see someone else I know have gotten the same opportunity! I can't wait to see what color bag I get! Beth Anne, yay! Looking forward to seeing your review!